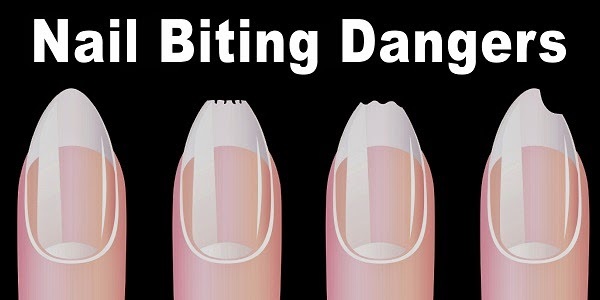 What Happens When You Are Biting Your Nails (And Why You Are Doing It).. If you are a nail-biter, or know someone who is, you know that it’s considered a bad habit. Aside from being socially frowned upon, nail-biting (onychophagia) can damage skin around the nail, causing fungal nail infections. This bad habit can also spread germs from your hands to your mouth. The underside of your nail creates a convenient crevice for dirt to get stuck in. As a result, having your fingers in your mouth increases germ transfer. When you bite your nails, you are also harming your teeth by compromising the way they are aligned. The Academy of General Dentistry estimates that the avid nail biter will develop $4,000 in dental bills over the course of his or her lifetime! Most people link nail-biting with anxiety and stress. But a March 2015 study from the Journal of Experimental Therapy and Experimental Psychiatry suggests a different reason for your habit. You have perfectionist traits. WHAT DOES BEING A PERFECTIONIST HAVE TO DO WITH ANYTHING? Body Focused Repetitive Behaviors (BFRB), like biting your nails, sucking your thumb and pulling your hair, were demonstrated when people who have BFRBs were unable to relax and perform tasks at a normal pace, which is characteristic of a perfectionist. These people became more easily frustrated, impatient, bored and dissatisfied when they could not progress and succeed in certain tasks during the experiment. They then turned to their bad habits for some kind of relief from their negative feelings. 48 participants were screened and tested. Half of them acted as the control group and the other half consisted of people who had BFRBs. All the participants were exposed to four separate experiments, each meant to incite a different feeling: stress, relaxation, frustration or boredom. The stress and relaxation experiments involved watching video clips that incited these feeling. The experiment on frustration involved the participants attempting to do a supposed “quick and easy” task, though the task was neither of these things. The experiment on boredom simply left the participants alone in a room with no stimulation for six minutes. People of all ages bite their nails, but fewer people tend to bite their nails as they get older. It most often occurs during puberty, and the urge usually goes away by the age of 30. KNOWING “WHY” YOU BITE YOUR NAILS IS IMPORTANT TO FINDING A SOLUTION.. Some people wear nail polish so that its bitter taste or the pleasing look deters them from biting their nails. Other people wear gloves, or some other kind of barrier. In some cases, a really short and thus aesthetically displeasing nail bed motivates people to stop biting their nails as well. Other tactics for kicking the habit include getting manicures, chewing gum, wrapping your fingernails with tape or using a toothpick to clean under your nails instead. But if you want more than a band aid solution to decrease the chances of a nail-biting relapse, you’re going to have to dig deeper. Once you know what’s triggering your habit, regardless of whether you relate to the perfectionist label or not, you can target the most effective way to stop biting your nails. In some cases, this may require therapy.